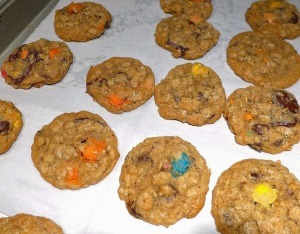 Oatmeal Candy Cookies fit all your holiday cookie needs! 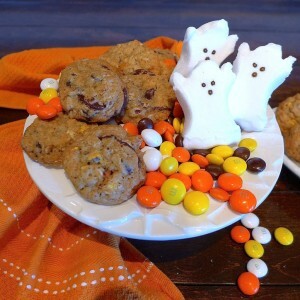 Here’s a basic oatmeal cookie that you can alter to suit your taste: choose your flour, type of butter, sugar and mix in, such as candy or chocolate chips. You could use gluten free flours and baking powder or sub vegan butter and replace the egg with flax seed and water. 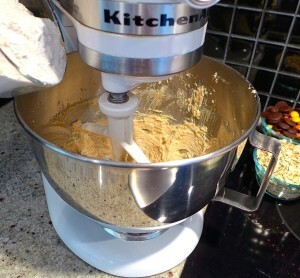 I like to use a mixer to cream the butter and sugar but you can do it the old fashioned way and mix softened butter and sugar by hand. 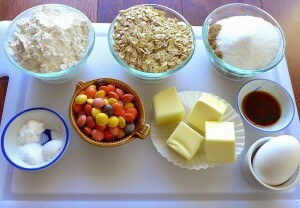 Make a habit of measuring out all your ingredients before you begin baking or cooking. 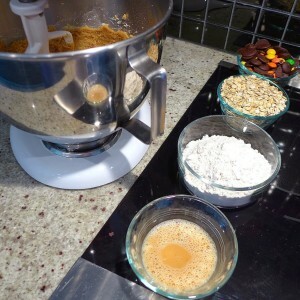 Set ingredients next to your mixing bowl to add them quickly and efficiently. 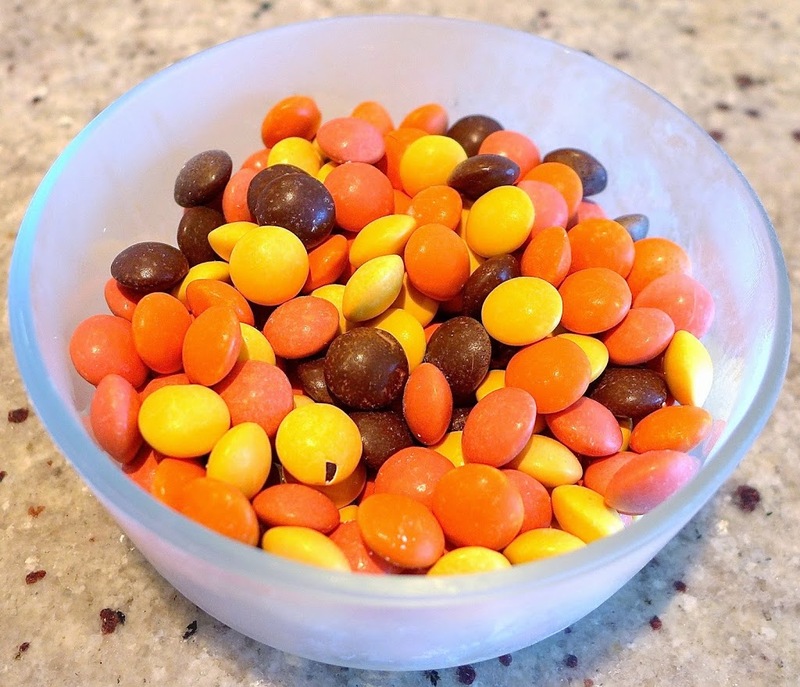 I did not have a full cup of M & M’s on hand, so I used a mixture of M & Ms and several different sizes of chocolate chips to make one cup. Get creative with your mix ins! Instead of adding candy, you could leave out the vanilla and add a spice like cinnamon or use lemon or orange zest. You could also use chopped dried fruit or nuts. 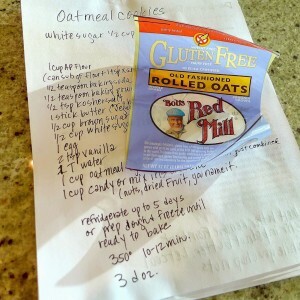 This recipe inspiration came from the back of Bob’s Red Mill Oatmeal bag. Use any oatmeal brand you like. I love the chewy texture of oatmeal cookies. 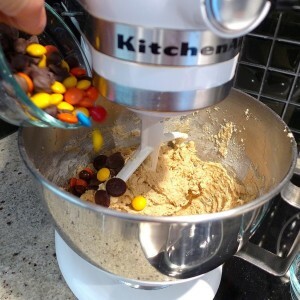 Use a small ice cream scoop or tablespoon to scoop about 3 dozen cookies. I like to scoop and either chill or freeze the dough balls a day ahead and have them ready to bake. 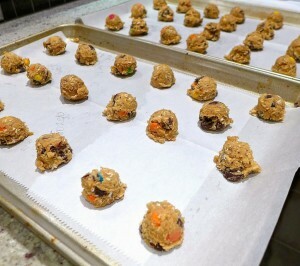 For chewy, thicker cookies, freeze dough balls before baking them. For flat, crispy cookies, chill dough, covered, for about an hour or up to three days before baking. Adapt these cookies to any holiday. Wrap unused cookies in plastic wrap and place in freezer for up to one month. 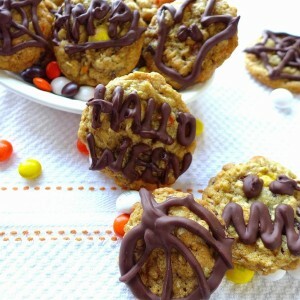 These cookies are perfect for decorating with chocolate. Practice making a few small drawings first. 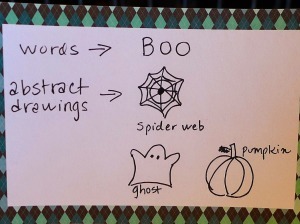 This works for any holiday. Melt a bag of chocolate chips in the microwave at half power on 30 second intervals and stir until chocolate is completely melted and smooth. 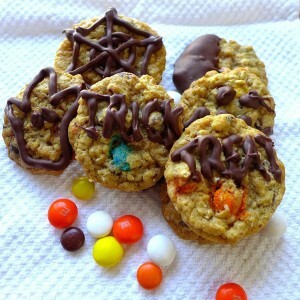 Pour melted chocolate into a ziploc bag, make a tiny snip in one corner and draw words or simple designs on the cookies. 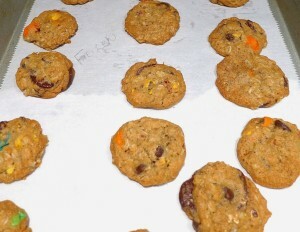 Place decorated cookies on a baking sheet lined with parchment and let chocolate cool completely, about one hour. 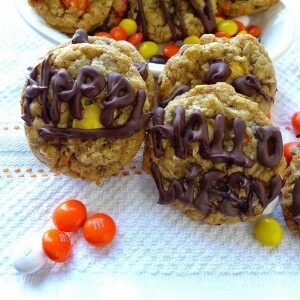 Dig in to oatmeal candy cookies. 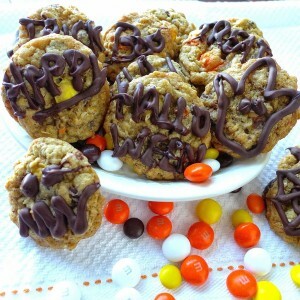 It’s an easy cookie you can customize and decorate for Halloween or ANY OCCASION. 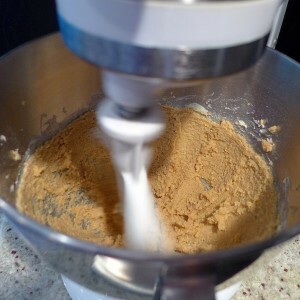 Cream together butter and sugars with an electric or handheld mixer until mixture is light and fluffy, about 5 – 7 minutes. Combine egg, vanilla and water and whisk to blend well. Add wet ingredientsto butter/sugar mixture and combine, scraping down the sides of the bowl. 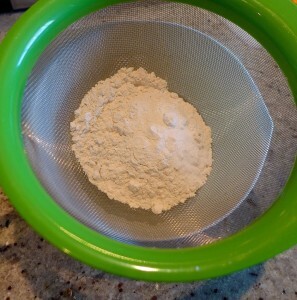 Add in flour and mix on low until flour just disappears. 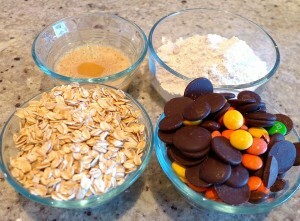 Add oatmeal and candyand mix until just combined. Cover bowl with plastic wrap and chill at least an hour or overnight. 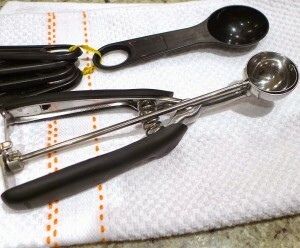 Form cookies: Use a small ice cream scoop or tablespoon to scoop and drop cookies (1 inch apart) onto 2 baking sheets. 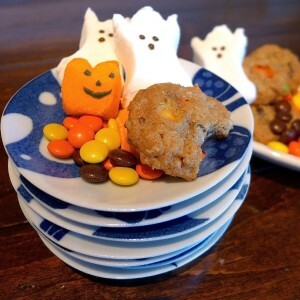 Optional: Wrap formed cookies on baking sheets with plastic wrap and freeze up to one month. Bake for 10 – 12 minutes or for frozen 12 – 14 minutes. Remove from ovenand let cool completely. Cookies will be soft but will firm up as they cool.